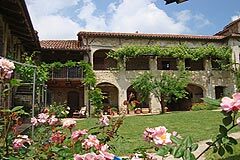 Group of Houses for sale in Piemonte Dogliani Near Dogliani, Monforte and Alba (ref: 6818)- A beautiful group of traditional Langhe stone houses currently run as a successful holiday rental business.. Piedmont Properties in Piemonte. Property for sale Langhe and Piemonte. Map for Property ref: 6818, Group of Houses for sale in Piemonte - A beautiful group of traditional Langhe stone houses currently run as a successful holiday rental business.